Tis the season for brews, which are always fun to enjoy in the company of good friends. 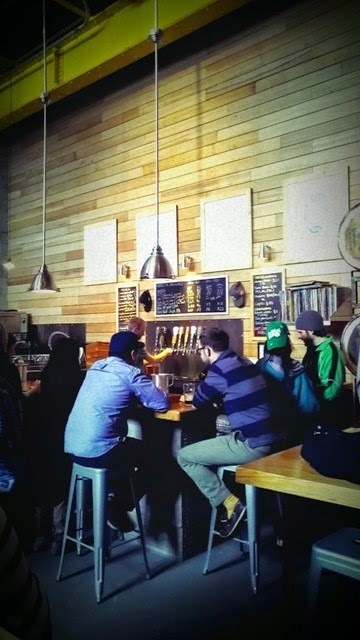 A great local watering hole such as SingleCut Beersmiths doesn't hurt either, and it was fun to observe just how excited people are about going there and enjoying its communal atmosphere. Kicking things of last weekend with Queens Beer Week, I noticed they have another weekend event coming up tomorrow that sounds like a lot of fun. Here are the deets for their Spring Suds event. Friday, April 25th at 8 p.m. Enjoy delicious local beers made by SingleCut Beermiths in the company of a live music, including a blend of classic rock, bluegrass and jam favorites (with special musical guest, Derek Anthony). In terms of beers, note that their Kim beer is back, which is tart and a little hot - infused with hibiscus and black currants. It's the perfect spring refreshment!